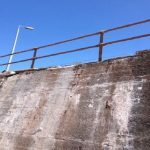 Highland Council contacted BAM Ritchies Concrete Techniques section to undertake emergency repairs to the sea wall which had been severely damaged by winter storm weather so as to prevent further damage. Given the tidal nature of the works, particular emphasis was placed on the pre-contract planning to ensure all considerations were undertaken to maximise productivity. 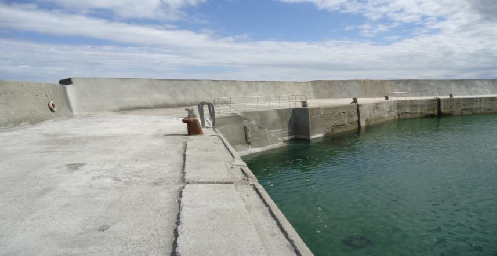 Specialist access equipment was sourced to enable works on the wall faces to be undertaken during all tidal levels. Flexible shift times were introduced to maximise the low water tidal periods. To ensure operative safety a full time manned safety boat was on site at all times and daily briefings emphasised the work-over-water nature of the works. The initial task was to clean the whole wall by high pressure water jetting to remove all the deposits that had amassed over the years on the wall. 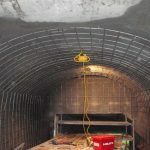 Then 16mm steel dowels were drilled and resin fixed into the wall to hold the A353 weldmesh that would form the reinforced part of the concrete overlay. To reinstate the breached section of the wall a “lost former” method was used, whereby a layer of debris netting and weldmesh was fixed along the centre line of the wall thickness. This temporary shutter was then sprayed on both sides with a thin layer of sprayed concrete. Reinforcing mesh was fixed both sides of this thin wall and sprayed concrete applied to both sides to build up the full wall thickness. The use of this “lost former” enabled the breach to be rapidly reinstated with no conventional formwork required. supervision was employed together with weekly clients inspections. For the sprayed concrete elements of the project daily test panels were sprayed alongside the works and taken to Inverness local authority laboratories for compressive strength testing. Highland Council also identified a number of further repairs on the structure that required remedial works and asked BAM Ritchies to undertake these additional works. These included repairing the steps, the pier head, parts of the deck and various parts of the inner harbour wall. The BAM Ritchies Concrete Techniques team worked on the project for four months, enabling the harbour to be handed back to the local users before the busy summer period. Value was provided to the client by working closely with all stakeholders to jointly come up with the most cost effective solution and quality construction and finish delivered within budget and on time.